Decades later, however, one of the men involved in digging them up confessed that the plates were a forgery, perpetrated with the intent of fooling Joseph Smith.6 Modern scientific testing of the one remaining plate confirms they were created using 19th century methods.7 So did Joseph fall for the hoax? Not quite. He briefly gave these artifacts due consideration, but did not try to acquire them, retain them, or ultimately find them of any value. Despite all the anticipation for a “sequel” to the Book of Mormon, nothing ever came.8 No translation was ever produced or published. No manuscript of a purported translation has ever turned up.9 Both William Clayton and Parley P. Pratt mentioned what appear to be some preliminary interpretations of a “portion” of the plates, which they attributed to Joseph,10 but Joseph himself never provided any kind of translation, in full or in part. The evidence from Joseph Smith’s journal for early May 1843 indicates that, “whatever JS initially thought about the plates, he soon lost interest in them.”15 The numerous entries in Joseph’s journal indicate that Joseph was busy entertaining several guests, holding court, attending business and religious meetings, overseeing economic transactions, and much more—but only one brief mention of the Kinderhook Plates is made.16 Some evidence even suggests Joseph wanted them examined by the Antiquarian Society of Philadelphia,17 so perhaps Joseph even suspected their fraudulence or had concluded that they were not religiously significant. In the Book of Mormon, when Limhi desired to know the contents of the ancient Jaredite plates, he asked Ammon, “Knowest thou of any one that can translate?” Ammon responded by telling him of King Mosiah, who could use his divine gift of seership to “look, and translate all records that are of ancient date” (Mosiah 8:12–13). Likewise, some of the men sincerely bringing the Kinderhook plates to Joseph Smith hoped he would use his gift of seership to look into his seer stone and translate the plates.18 The Kinderhook story reminds us that the gifts of the Spirit are not to be used to satisfy the idle curiosities of man. Instead, Joseph approached these artifacts by using ordinary language translation methods, and in the end did not produce even a proposed translation. In fact, evidence suggests his secular examination efforts did not go very far. Analysis from historians Mark Ashurst-McGee and Don Bradley indicate that the translated “portion” mentioned by William Clayton and Parley P. Pratt comes from a single “boat-shaped” character in the Egyptian Alphabet (a vaguely similar character appears on one of the Kinderhook Plates facsimiles).19 If he made any effort to acquire a revelatory translation, that also did not succeed. 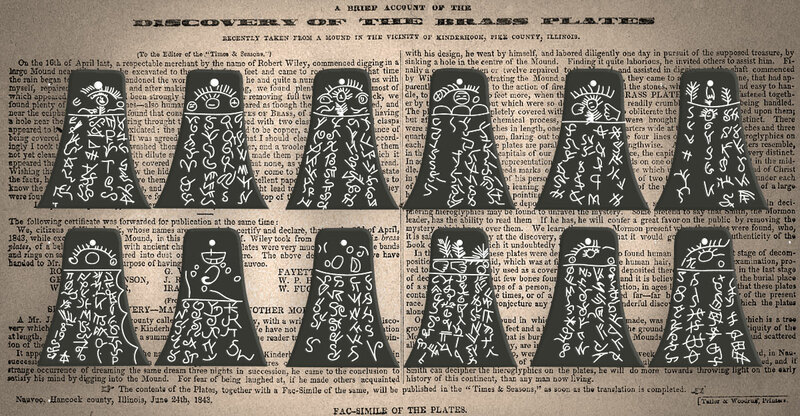 Today, we can see why: the Kinderhook plates were not legitimate. They were not “of ancient date,” so his gift of translation did not come to bear. Illustration o the "boat-shaped" character in the Kinderhook plates and the Grammar and Alphabet of the Egyptian Language. Image via Book of Mormon Central. While some critics try to use this story as evidence that everything about Joseph Smith was a fraud, the historical evidence suggests that Joseph ultimately did not fall for the hoax—he never tried to purchase the plates, hire scribes, and go into translation mode, like he did with the ancient Egyptian papyri he had purchased in Ohio. He never produced a “Book of Kinderhook.”20 Whatever Joseph Smith may have thought of the Kinderhook plates, the Lord could not be fooled. God would not and did not reveal a translation of these bogus artifacts. The more universal message from the Kinderhook incident is that Joseph’s ability to translate, like the case of Mosiah’s in the Book of Mormon, was a gift from God, and only worked when God enabled him to do His will. The gift of “the interpretation of languages,” like all spiritual gifts, “come[s] by the Spirit of Christ; and they come unto every man severally, according as [Christ] will” (Moroni 10:16). Like Joseph and Mosiah, we all have gifts from the Lord, which can only be properly used to build-up the kingdom of God. If we try to use these gifts from the Lord for inappropriate or irrelevant purposes, we can expect underwhelming results, like those from the case of the Kinderhook plates. Don Bradley and Mark Ashurst-McGee, “Joseph Smith and the Kinderhook Plates,” in A Reason for Faith: Navigating LDS Doctrine and Church History, ed. Laura Harris Hales (Salt Lake City and Provo, UT: Deseret Book and BYU Religious Studies Center, 2016), 93–115. Mark Alan Wright, “Joseph Smith and Native American Artifacts,” in Approaching Antiquity: Joseph Smith and the Ancient World, ed. Lincoln H. Blumell, Matthew J. Grey, and Andrew H. Hedges (Salt Lake City and Provo, UT: Deseret Book and BYU Religious Studies Center, 2015), 131–133. Brian M. Hauglid, “Did Joseph Smith Translate the Kinderhook Plates?” in No Weapon Shall Prosper: New Light on Sensitive Issues, ed. Robert L. Millet (Salt Lake City and Provo, UT: Deseret Book and BYU Religious Studies Center, 2011), 93–103. Stanley B. Kimball, “Kinderhook Plates Brought to Joseph Smith Appear to Be a Nineteenth Century Hoax,” Ensign, August 1981, online at lds.org. 1. W. P. Harris, Letter to the Editor, Times and Seasons 4, no. 12, May 1, 1843, 186. 3. Charlotte Haven, “A Girl’s Letters from Nauvoo,” Overland Monthly 16, no. 96, December 1890, 630; letter written May 2, 1843. 4. Parley P. Pratt and Orson Pratt to John Van Cott, May 7, 1843; in Brian M. Hauglid, “‘Come & Help Build the Temple & City’: Parley P. and Orson Pratt’s Letter to John Van Cott,” Mormon Historical Studies 11, no. 1 (Spring 2011): 155. 5. “A Gentile,” letter to James Gordon Bennett, May 7, 1843, in “Late and Interesting from the Mormon Empire on the Upper Mississippi,” New York Herald, May 30, 1843. The editor of the Quincy Whig even stoked the fires: “Some pretend to say, that Smith the Mormon leader, has the ability to read them. … if Smith can decipher the hieroglyphics on the plates, he will do more towards throwing light on the early history of this continent, than any man now living.” “Singular Discovery—Material for Another Mormon Book,” Times and Seasons 4, no. 12, May 1, 1843, 186–187; originally published in the Quincy Whig 6, no. 2, May 3, 1843. 6. Wilbur Fugate to James T. Cobb, June 30, 1879, in Wilhelm Wyl (Wymetal), Mormon Portraits (Salt Lake City, 1888), 207–208. This wasn’t the only time folks came to Nauvoo with the intent of exposing Joseph Smith as an impostor. A year earlier, in April 1842, Henry Caswell visited Nauvoo and later said he showed Joseph a copy of a medieval Greek manuscript. Joseph allegedly identified the manuscript as Egyptian, which Caswell took as evidence of Joseph’s ignorance of ancient languages. For a reasonable assessment of this incident, see John W. Welch, “Joseph Smith’s Awareness of Latin and Greek,” in Approaching Antiquity: Joseph Smith and the Ancient World, ed. Lincoln H. Blumell, Matthew J. Grey, and Andrew H. Hedges (Salt Lake City and Provo, UT: Deseret Book and BYU Religious Studies Center, 2015), 311–314. 7. See Stanley B. Kimball, “Kinderhook Plates Brought to Joseph Smith Appear to Be a Nineteenth Century Hoax,” Ensign, August 1981, online at lds.org. 8. Near the end of June, a broadside published by John Taylor and Wilford Woodruff, still promised, “The contents of the Plates, together with a Fac-simile of the same, will be published in the ‘Times & Seasons,’ as soon as the translation is completed.” See “A Brief Account of the Discovery of the Brass Plates Recently Taken from a Mound near Kinderhook, Pike County, Illinois,” (Taylor & Woodruff, June 24, 1843). 10. See George D. Smith, ed., An Intimate Chronicle: The Journal of William Clayton (Salt Lake City, UT: Signature Books, 1995), 100; Pratt to Van Cott, May 7, 1843, in Hauglid, “Come & Help Build,” 155. 11. JS Journal, May 7, 1843, in Hedges, Smith, Rodgers, eds., Journals 3:13. 12. “A Gentile,” letter to Bennett, May 7, 1843. This source mistakenly associates the Egyptian Alphabet with the Book of Mormon, instead of the Book of Abraham, an understandable mistake for an outsider. The Egyptian Alphabet is part of the corpus known by historians as the Kirtland Egyptian Papers. It has Egyptian characters from the Joseph Smith Papyri with attempted “interpretations” next to them. Currently, there is disagreement among scholars regarding the nature and purpose of the KEP and their relationship to the Book of Abraham. For various perspectives, see Kerry Muhlestein, “Egyptian Papyri and the Book of Abraham: A Faithful Egyptological Point of View,” in No Weapon Shall Prosper: New Light on Sensitive Issues, ed. Robert L. Millet (Salt Lake City and Provo, UT: Deseret Book and BYU Religious Studies Center, 2011), 228–229; Brian M. Hauglid, “The Book of Abraham and the Egyptian Project: ‘A Knowledge of Hidden Languages’,” in Approaching Antiquity: Joseph Smith and the Ancient World, edited by Lincoln H. Blumell, Matthew J. Grey, and Andrew H. Hedges (Provo, UT: Religious Studies Center; Salt Lake City: Deseret Book, 2015), 474–511; John Gee, An Introduction to the Book of Abraham (Salt Lake City and Provo, UT: Deseret Book and BYU Religious Studies Center, 2017), 13–39. 13. Pratt to Van Cott, May 7, 1843, in Hauglid, “Come & Help Build,” 155. 14. See Brian M. Hauglid, “Did Joseph Smith Translate the Kinderhook Plates?” in No Weapon Shall Prosper: New Light on Sensitive Issues, ed. Robert L. Millet (Salt Lake City and Provo, UT: Deseret Book and BYU Religious Studies Center, 2011), 93–103. 15. Hedges, Smith, Rodgers, eds., Journals 3:13 n.28. 17. See Kimball, “Kinderhook Plates,” on lds.org. 18. Years later, in a letter to a Mr. Flagg, one of the men who brought the plates to Nauvoo indicated that he did not know, at the time, that the plates were a hoax, and that he was sincerely interested in learning more about them. See W.P. Harris to Mr. Flagg, April 25, 1855, in “A Hoax: Reminiscences of an Old Kinderhook Mystery,” Journal of the Illinois State Historical Society 5 (July 1912): 271–273. 19. Don Bradley and Mark Ashurst-McGee, “Joseph Smith and the Kinderhook Plates,” in A Reason for Faith: Navigating LDS Doctrine and Church History, ed. Laura Harris Hales (Salt Lake City and Provo, UT: Deseret Book and BYU Religious Studies Center, 2016), 93–115.